Our hands-on tests revealed a great set of highly recommended toddler bicycles that are fun, safe, durable, and inexpensive. Before we get into the ratings and reviews of the best kids bikes of 2019, let's go over a few things that are important to look for in a toddler bike. First, you need to find a bike with age-appropriate size and features, including wheel size, but also shifters and brakes. Second, you need to figure out whether you'll start with a balance bike or training wheels. Third, you need to consider durability and reliability, which will help keep things moving in even the bumpiest of circumstances. It will also help them stick around for several years and become a great hand-me-down. Finally, you need to consider safety and cost. For more details on each of these factors, scroll down to the bottom of this page. Otherwise, let's get into the results! Here are the Best Kids Bikes of 2019! 1. 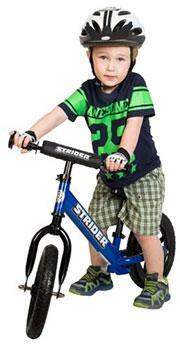 The Strider 12" Classic or Sport Balance Bikes, Ages 18 months to 3 years. We admit we've jumped on the balance bike bandwagon, and we think it's for some really great reasons. First, the Strider is super lightweight (about 8 pounds), extremely well constructed, fun, and great-looking. The Strider focuses on the fundamentals of riding a bike: balance, leaning, steering. Your child learns how to completely control a bike's speed and direction, all while strengthening their core, legs, and helping build confidence, balance, and stamina. No need for training wheels here, and after building expertise on the Strider, there's no need for training wheels ever! It's no wonder that Strider has sold over a million of these bikes since they were introduced a few years ago, it's really a great concept. Of course there are other balance bikes worth considering, but the Strider is first in its class for some great reasons. First, the Strider has a built in foot rest on the rear frame, so when your child builds confidence, he or she can rest their feet on the frame and cruise. Second, the frame, wheels, tires, and components are very durable: our two boys have used Strider bikes for over 2 years now, sometimes very aggressively, and there have never been any issues. Third, ths Strider seat and handlebars adjust up and down to accommodate a growing child: the seat adjusts from 11" to 17" and the handlebars from 18" to 22". Finally, Strider stands by their products and has a history of quickly and fully resolving any rare customer issues. 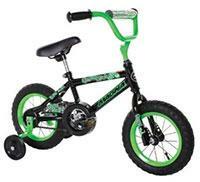 Note that there are three versions of the 12" Strider bike: the Classic, the Sport, and the Pro. The Classic is the most limited, entry-level model that does not include handlebar pads, quick-adjust (no tools) handlebar or seat height, or the nicer handlebar grips. The Sport does include all of those, plus also an extra, larger seat that accommodates up to 5 year olds, and some really awesome colors and options! Finally, the Pro is for the adventurous rider and racer, and includes everything the Sport does plus a very lightweight (5 pound) aluminum frame, and an awesome customizable racing number for the front! Overall, highly recommended, and we prefer the Sport version (the Sport is pictured)! 2. 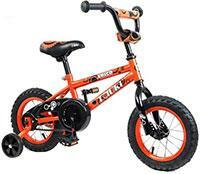 Tauki Amigo 12" Toddler Bike BMX Style. If you're not into the concept of a balance bike, and instead want the traditional pedal bike, this is in our opinion one of the best on the market! Tauki makes a very high quality and heavy duty bike that will last your kid for many years to come! It uses a steel frame, real rubber and air tires for a comfortable ride, pedal brake, removable training wheels, and adjustable seat and handlebar heights. The Amigo has great small handlebar grips for little hands, and we liked how well the chain and front cog were covered to keep out of the reach of little fingers and legs. It also has all the cushions and reflectors we like to see in a bike. In our testing, we found the wheel bearings to be nice and smooth, the tires to have high quality traction, and the seat and handlebar grips to be very comfortable. Our test toddler was 25" tall and he was just tall enough to reach the pedals from the lowest seat position; a secret is that we removed the rear reflector to get the seat to drop down an extra half inch for the shortest kids. In our testing, the brakes were smooth and worked very well. The pedals were nice and grippy without being too sharp and scratching up the back of our kid's legs. We liked how beefy the tires were, which made it nice for flat gravel trails in the local National Park. And the style is cute, with several color options, while also being subdued and not "in your face" like some other options. By the way, assembly took about 10-15 minutes and was surprisingly easy. Overall, this is an excellent traditional pedal-style bike with all the right features, great build quality, and cute color options! 3. 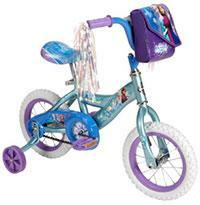 Huffy Disney Frozen 12" Bike. This is one of the most adorable bikes on the market right now, and is truly the bike of many little kids' dreams! With the bright frosty teal and purple colors, the front Frozen basket, and the handlebar tassles, it doesn't get much cuter. And it has great features too. A quick-adjust seat comes standard, as do training wheels, padded handlebars, a comfy seat, and good build quality. The (white) tires were decently knobby for traction, and the wheels had low rolling resistence which was nice. The frame overall is a bit smaller and shorter in overall length than the Tauki, but with the seat and handlebars adjusted up, our 4 year old neighbor was able to ride it without any issues (like knees hitting the handlebars). So if there's a little one in your life who is crazy for Frozen, this could be perfect first bike! Note that this bike is also a bit less expensive on average than the Tauki option, coming in at around $80. 4. Paw Patrol 12" Bicycle. 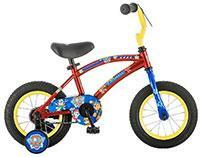 This yellow, red, and blue bike is perfect for toddlers who love Paw Patrol and its adorable characters. With bright yellow handlebars and wheels, paw prints and pictures of several characters, this bike is a neighborhood hit! A really nice touch is the Paw Patrol training wheels: while most bikes don't apply any theme to the training wheels, this bike goes above and beyond! Some great additional features are the adjustable seat height (quick-adjust), adjustable handlebars, the very low rolling resistance tires (but they are also not knobby at all for gravel or dirt paths), the chain and front cog cover, and a very smooth and effective pedal brake. It also has a small sign on the front with a raised texture picture of Paw Patrol characters. A bit more expensive than the Huffy or Dynacraft, but very high build quality. Only one downfall with this bike, however: there is no padding on the handlebar, which is unfortunate. So overall a great bike with one little con; if your kid is a die-hard Paw Patrol fan, this is a great option, and it would also go very well with a Paw Patrol helmet! 5. Dynacraft Magna Gravel Blaster 12" Bike. This is a cool styled bike that's perfect for those more adventurous kids who are just getting started riding. All green and black, it looks pretty sleek and fun, and also includes some great features. For safety, it has the padded handlebar and a chain and front cog cover. For adjustments, the seat is adjustable (not quick-adjust, needs a wrench), as are the handlebars. The training wheels are also adjustable within a limited range to keep things nice and even. The tires are not quite as knobby as the Tauki, but did have lower rolling resistence on sidewalks, which was nice. We didn't find the build quality up to par with the Tauki, and some people online mention an issue with the front fork welding being misaligned and preventing the front wheel from fitting onto the fork. We didn't have that issue, but it's worth mentioning. We will note, however, that the Magna customer service is excellent and will quickly accommodate any issues you have with the bike. Overall, this bike has great features at a reasonable price matching the Disney Frozen bike above, though there are some inconsistencies with the build quality. Here are more details on the factors to consider when finding the best kids bikes! Age-appropriate size and features: This is one of the most important things when buying your toddler his or her first bike. A first bike for a young kid (2-3 years old) should be a 12" size, which means that the wheel diameter is 12" and the lowest seat height setting is usually around 11-12" off the ground. We do not recommend getting a larger bike for a new rider, as it will only make things more difficult: it will be harder for the little legs and feet to reach the ground, harder to steer, and heavier. We also want to be clear that toddler bikes should never have hand brakes, they should only use the traditional pedal brakes that activate when the child pedals backwards. Their hands just aren't large enough for hand brakes, and they're just need more time to learn and get comfortable with the bike before complicating things. Same goes for gears, but those are basically impossible to find on a toddler bike. If you are considering a pedal bike (not a balance bike), then you also want to make sure there is a chain cover so your little one's legs don't get greasy or injured by the chain. Most have a top cover, and some cover the entire chain. Training wheels or balance bike? This is an increasingly common question among new parents. The traditional bicycle with training wheels is starting to lose favor, with many parents opting for the balance bike. Balance bikes, like the Strider, do not have pedals or training wheels and instead rely upon the child to push the bike around with their legs, like a ride-on toy. The idea is that when your children learn to ride a balance bike first, they will never learn to rely on training wheels and will be better able to transition to a pedal bike when the time comes. We don't know of any peer-reviewed research demonstrating this fact, but we do know that many of our pediatrician and physical therapist friends use balance bikes for their children. In our experience, balance bikes are great ways to teach toddlers how to balance a bike. It will be difficult at first, but after a few months of practice they will be cruising down the road with their legs up and fully balanced! However, we also want to mention another strategy: buy a pedal bike and remove the pedals and training wheels, and it's a balance bike that can convert back at any moment. Finally, practice with anything that involves whole-body postural control will help a child learn to ride a bike - even the best kids scooter is a great way to train that level of coordination! Safety first! For safety, always make sure your child is wearing a correctly-size helmet. 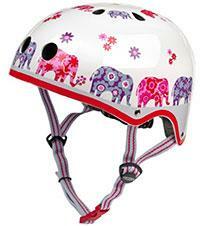 There are so many adorable and cool helmets for toddlers nowadays, and they are as cheap as about $15. Some of our favorites and most fun and adorable helmets are the Raskullz and Nutcase brands, which include shark, bumblebee, mohawk, and unicorn styles! Also make sure the bike has padding in the right places where kids tend to get injuries: padding should be on the center handlebar, seat, and sometimes on the headset/stem knuckle. Reflectors on the wheels, pedals, front, and back are great too. Never let them ride on the road, at night, and never start them on a hill! Once you think your child is ready for something a little more challenging (we're talking to you, dad), think carefully and try to very slowly up the difficulty of the terrain. We've seen many bad falls from children on trails and sidewalks that were too hilly, narrow, or bumpy. When in doubt, take it easy, you want the bike learning experience to be fun and your child to make good memories!